The Slim Sonic brings a whole new dimension to sonic toothbrushes, merging fashion, ease of use, and best of all, its slim size make it a perfect on-the-go companion. It’s convenient and truly compact. Fashion meets functions with a great big healthy smile. Designed for the smart, on the go, fashion forward woman who appreciates value and products that deliver what they promise. SLIM is the first portable sonic toothbrush with a snap on vented mascara style cap. It stays clean and dry, making it perfect o carry in your purse, cosmetic case, backpack or briefcase. Take it with you to the office, to travel or simply keep it in your car for last minute freshening up. Fast cleaning. Gently polishing off surface stains. Removes plaque along the gum line and deep between teeth. Our SLIM Sonic toothbrush is the first battery operated, portable toothbrush with a vented mascara-style cap. Now you can smile in style wherever you are; at the office, after lunch, or before your special night out. With the Slim Sonic, you’ll have your pick of a variety of stylish designs in a compact case that’s perfect for anywhere you go. 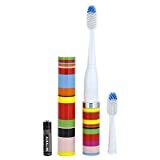 Best of all, you’ll receive an extra brush head FREE, and the SLIM design is compatible with all Violife toothbrush sanitizers. 22, 000 brush strokes per minute guaranteed.